High-quality network cable consisting of four twisted pairs of wires for building computer networks. 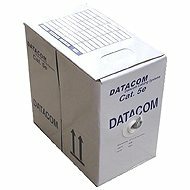 The cable features shielding to minimise electromagnetic interference from the environment, making it suitable for environments with strong signal interference. 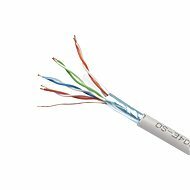 Its protective PE coating also makes the cable suitable for outdoor use and for all areas subject to strong environmental interference. For shipping to other EU countries visit this page Datacom, wire, CAT5E, FTP, PE outdoor, 305m/box. Für Versand nach Deutschland, besuchen Sie bitte Datacom, Draht, CAT5E, FTP, für den Einsatz im Freien, 305 m / Karton. Chcete doručit zboží do Česka? 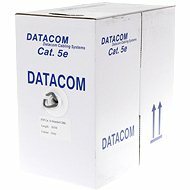 Prohlédněte si Datacom drát, CAT5E, FTP, PE venkovní, 305m/box. Chcete doručiť tovar na Slovensko? 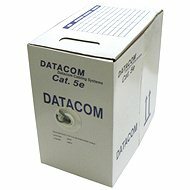 Prezrite si Datacom, drôt, CAT5E, FTP, PE vonkajší, 305 m/box. Für Versand nach Österreich, besuchen Sie bitte Datacom, Draht, CAT5E, FTP, für den Einsatz im Freien, 305 m / Karton. Magyarországra történő kiszállításért tekintse meg ezt a termékoldalt: CAT5E, FTP, PE kültéri 305 m / csomag.